Beautiful card Annabelle!! I love the stitching!! 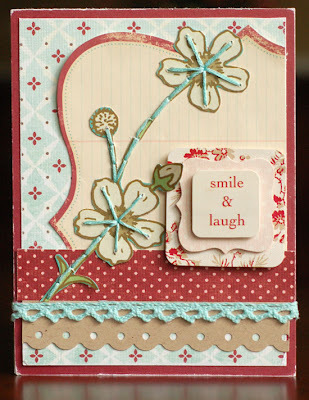 Gorgeous card Anabelle. Your stitching is wonderful!! Gorgeous card! Love the stitching! beautiful, beautiful card!! love the stitching! So cute Annabelle! The stitching adds such a great, soft detail! so darling Anabelle---this is sweet--my favorite colors too! sigh...this is perfect! Just perfect Anabelle! I have to agree! That stitching really gives that card some texture! I'm going to have to practice up and get to stitchin! WOW that is amazing!!!! I have NEVER done that much hand stitching! But now I have a feeling I will need to go get some floss and try it out! Sooo pretty! What a gorgeous card! I always love all of your little details and stitching. Anabelle, this is SO beautiful! That trim, the stitching--it all adds up to sheer perfection! your blog is EYE CANDY! Love all the detail you put into your work....BEAUTIFUL!! !